Bordering on becoming prolific, if not persistent, Mastercastle delivers their third album, Dangerous Diamonds, in as many years. From the start, The Phoenix (2009), we've recognized Mastercastle to be the platform for versatile guitar great Pier Gonella (also Labyrinth, Odyssea, Necrodeath) and compelling vocalist Giorgia Gueglio. Once more this rings true. Much like their previous work, Last Desire, expect more melodic hard rock with a metal edge lead be beautiful vocal arrangements and stinging guitar solos. While the latter is expected, and fans of ripping neo-classical guitar will not be disappointed, Ms. Gueglio vocals are soaring and spectacular Certainly, she handles the hard rock/metal of Another Flower, and the speedy Dangerous Diamonds with ease. But the atmosphere and intrigue of her voice on Alone, Icy Moon, Au Premiere Coup, and the marvelous Time 4 Lovers are stratospheric. Couple this with immense rock groove of the songs, and they become quite stirring. Later, her vocals over acoustic guitar on the ballad Lovin' Me may send chills down your spine. But not to slight the principal Pier Gonella at all, he also offers his own bright lights of fret creativity. Most notable work was found on Time 4 Lovers, Icy Moon, and Au Premiere Coup to name a few favorites. The expected and adequate instrumental Blue Diamond was trumped easily by the rest of the album. 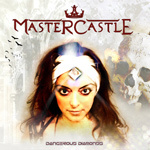 Bottom line: if you loved the past two Mastercastle albums, then you'll love Dangerous Diamonds. (However, I'll pass on the cover art. Ugh.) Recommended. If you loved the past two Mastercastle albums, then you'll love Dangerous Diamonds. Recommended.